1/2 cup shortening, 1/2 cup butter, 3 cups self rising flour, 1 cup packed brown sugar, 1/2 cup sugar, 2 eggs, 1 tsp. vanilla, 2 cups chocolate chips. �Bake at 350 degrees for 10-12 min. or until done. 2 cups sugar, 1 can evaporated milk, 1stick butter-bring to boil and boil for 2 min. 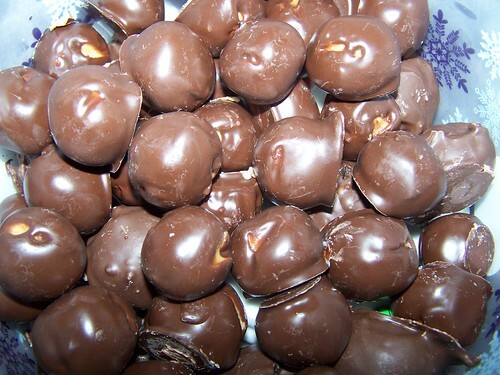 �Add 1 tsp vanilla and 6 oz chocolate chips. � Continue boiling until smooth. 2 boxes powdered sugar, 1 stick butter softened, 1 can sweetened condensed milk, 1 tsp. 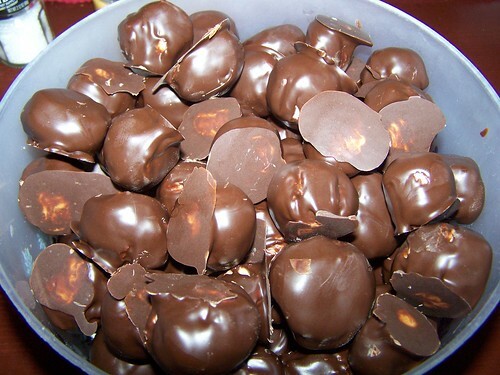 vanilla.��Using mixer, blend�ingredients together.�� Mixture will be stiff.� Add 4 cups chopped pecans.� Put powdered sugar on hands and roll into small balls.� Chill.� Dip balls into melted chocolate.� Use 4 cups chocolate chips and 1/2 block parafin wax.�� DELICIOUS! We are going to get some tires put on the front of the car.� Hubby didn’t work today, so he is going with us.� I’m glad.�� Enjoy your day and God bless. Time for us to leave for piano practice.� Enjoy your day and God bless.